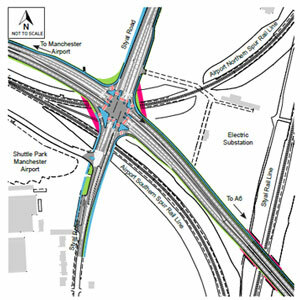 The first phase of consultation on the proposed A6 to Manchester Airport Relief Road scheme took place from 22nd October 2012 to 25th January 2013. More detailed information about the scheme was provided as part of the Phase 1 consultation. This information can be found by clicking on the navigation buttons on the left hand side of the page. Outlined below are the different options for six junctions along the route. The junction options formed part of the Phase One consultation that ran between 22nd October 2012 and 25th January 2013. 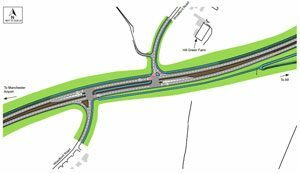 There are two options for a new junction on the scheme with Styal Road. 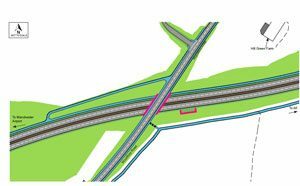 The two junction options are proposed to intersect with Styal Road and cross the rail lines at different points. Option 1 – Traffic lights controlled cross roads over airport spur rail lines. The scheme has a junction with Styal Road, controlled by traffic lights. The existing bridge over the railway lines is widened to accommodate the wider road. Option 2 – Traffic lights controlled cross roads to the north of the airport spur rail line. The scheme has a junction with Styal Road, controlled by traffic lights. The existing bridge over the railway lines is utilised although an additional bridge over the airport spur rail line would be required. 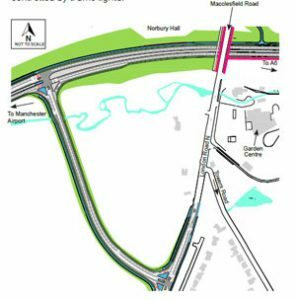 There are two options for upgrading the existing A34/Stanley Road junction. 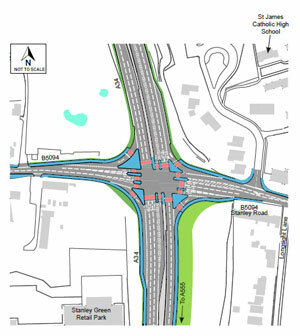 A four arm roundabout joins the A34 and Stanley Road, controlled by traffic lights. Pedestrians and cyclists would be able to cross the A34 in stages using the controlled crossings. This option has two crossing points for pedestrian and cyclists making it a simpler crossing movement. The A34 has a junction with Stanley Road, controlled by traffic lights and has four arms. Pedestrians and cyclists would be able to cross the A34 in stages using controlled crossings. This option has more crossing stages for pedestrian and cyclists, making it more complex to cross. Requires the use of less land than Option 1. 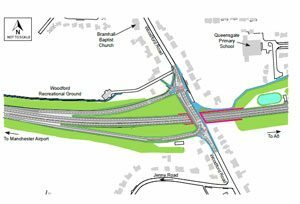 There are two options for a new junction on the scheme with Woodford Road. The scheme passes under Woodford Road which is on two bridges. On Woodford Road traffic heading south will use one bridge. Traffic heading north on Woodford Road, towards Bramhall would use the other bridge. Slip roads enable traffic to get on and off the scheme to and from the west only. 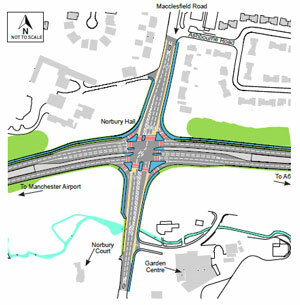 The junctions of the slip roads and Woodford Road would be controlled by traffic lights. The scheme passes under Woodford Road which is on a bridge. Slip roads enable traffic to get on and off the bypass to and from the west only. The junctions of the slip roads and Woodford Road would be controlled by traffic lights. There are two options for a new junction on the scheme with Chester Road. Option 1- Scheme connects to Chester Road via a new short link road. 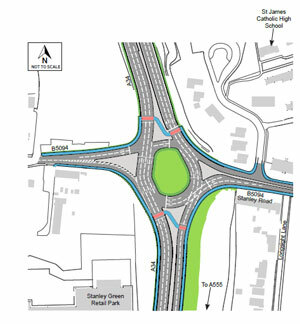 The scheme has a large traffic lights controlled roundabout junction. The scheme has a large roundabout junction with the new link road and the Oil Terminal Access Road, which is controlled by traffic lights. The new link road, from the scheme, forms a junction with Chester Road which is set back and controlled by traffic lights. Option 2 – Scheme connects to Chester Road via a new short link road. 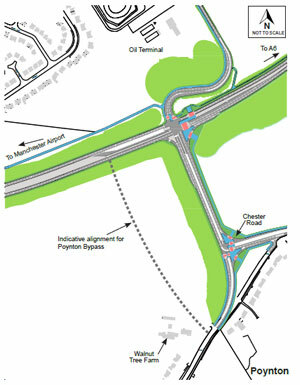 The scheme has a traffic lights controlled cross roads junction with a new link road and the Oil Terminal Access Road. 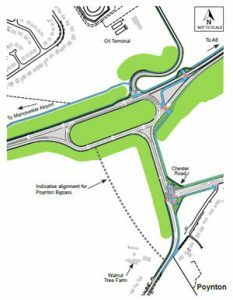 The scheme has a junction with the new link road and the Oil Terminal Access Road, which is controlled by traffic lights. The new link road has a junction, which is set back and controlled by traffic lights, with Chester Road. 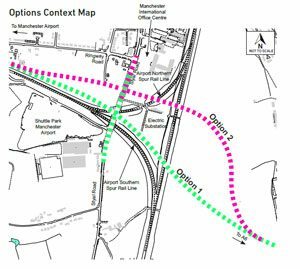 The Poynton Bypass is not part of the A6 to Manchester Airport Relief Road proposal. The design of the A6 to Manchester Airport Relief Road will enable the proposed Poynton Bypass to be developed by Cheshire East Council in the future. 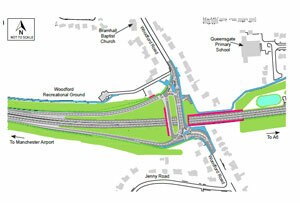 There are two options for arrangements with Woodford Road and the scheme. The scheme passes under Woodford Road which is on a bridge. Traffic cannot join the scheme at this junction but northbound traffic would be able to join the scheme using the junction at Chester Road. 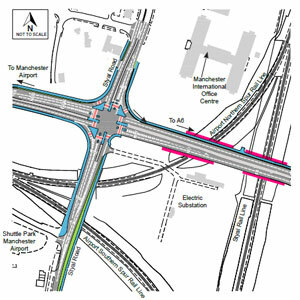 Southbound traffic would be able to join the scheme at the Macclesfield Road junction. The scheme has two staggered T- junctions with Woodford Road. A junction to head north on Woodford Road, with a second to head south on Woodford Road from the scheme, both of which are controlled by traffic lights. Traffic heading north and south on Woodford Road would have to join the scheme in order to progress along Woodford Road. Pedestrians and cyclists would be able to cross the scheme using controlled crossings at each junction. There are two options for a new junction on the scheme with Macclesfield Road. The scheme has a junction with Macclesfield Road, controlled by traffic lights. The scheme would be more visible for local residents but would provide less disruption due to shorter construction time. The scheme passes under Macclesfield Road which is on a bridge. A new link road, with a shared cycleway/footpath, will connect the scheme to London Road South. The new link road will have junctions on either side controlled by traffic lights.